Rolls… they’re my weakness. 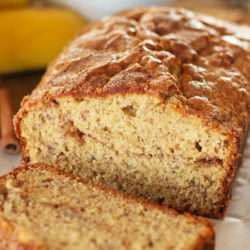 I mean, who can resist that squishy, buttery, golden brown goodness? I can’t. 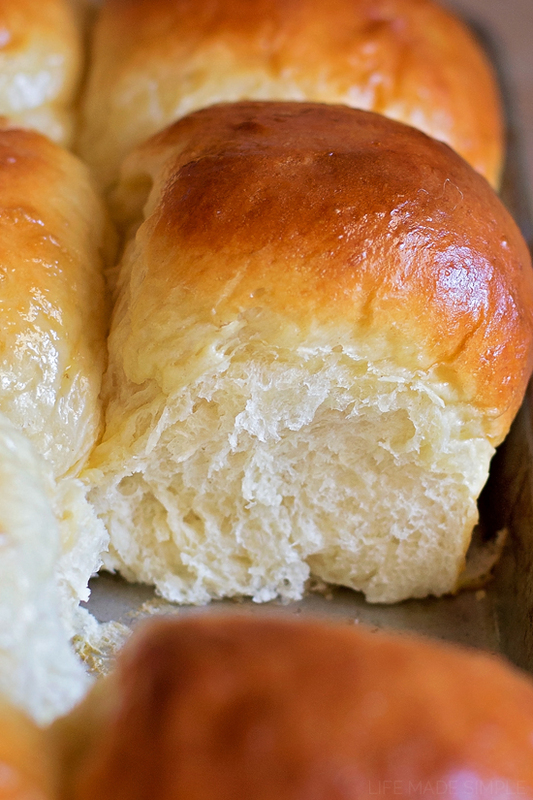 These heavenly dinner rolls have been a favorite of ours for months now. They’re kind of a labor of love, but so so worth it. ???????? Don’t let me scare you off. By labor of love, I mean that they’re more time consuming than my 1 hour soft & fluffy dinner rolls. ???? But they’re definitely doable- just ask my little sous chefs. They were there every step of the way. 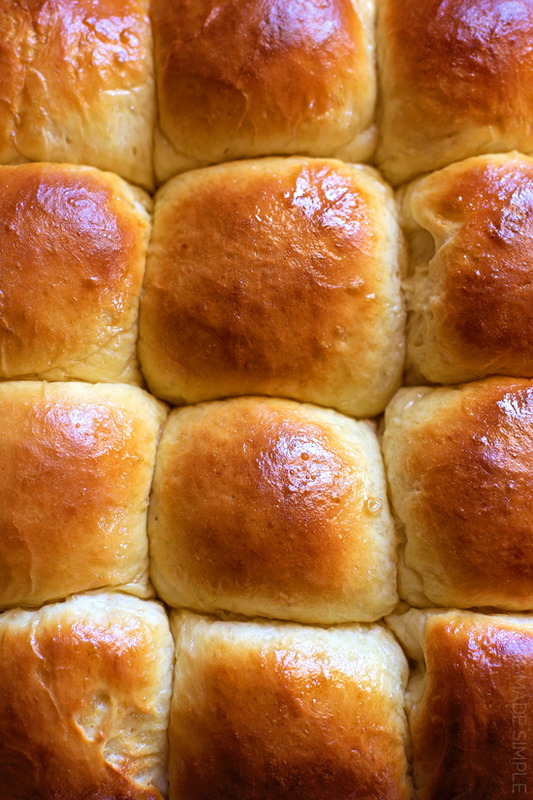 What makes these rolls extra amazing is 1.) their starter (milk, water, flour, cooked into a thick paste) 2.) dry milk 3.) a 20 minute knead time <- yes, 20 MINUTES ???? You’ve got this! 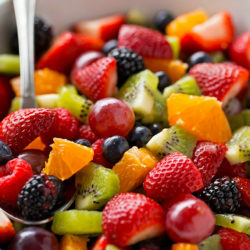 To make the starter, in a small saucepan set over low heat, whisk together the whole milk, water and flour until smooth. Cook until the mixture thickens, about 3 to 5 minutes. Remove from the heat and set aside. Then, in the bowl of a stand mixer, combine the flour, dry milk (use a quality brand if you can like Bob’s Red Mill or King Arthur Flour), granulated sugar, salt and instant yeast. Mix on low until combined. In a 2 cup glass measuring cup, warm the milk in the microwave (I do about 45 seconds). Whisk in the starter, eggs and melted butter. With mixing speed on low, gradually add the wet ingredients. Mix just until a dough forms. Switch to the dough hook and knead for 15-20 minutes. 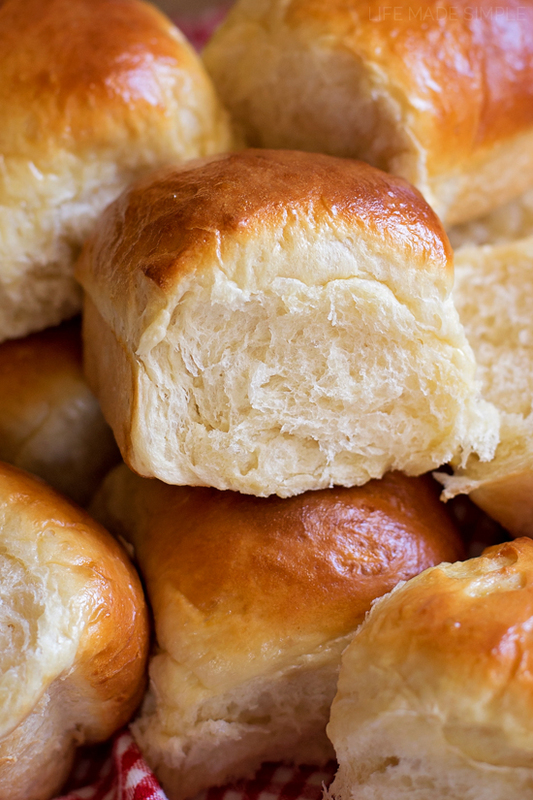 This is what helps give these rolls their flaky, pull-apart texture. I highly recommend doing the full knead time!! Shape the dough into a ball and transfer to a lightly buttered bow. Cover with plastic wrap and place into a warm oven (I turn mine on to 200 degrees, then turn it OFF when it reaches that temperature) for 60 to 90 minutes or until doubled. Gently deflate the dough by pressing a fist into the center. Divide into 12 equal pieces, and shape each piece into a ball. I like to pinch the bottom of the balls of dough and then form a C shape with my hand and roll the ball on the counter to make a smooth, tout circle. Does that make sense? If not, check this video out. It helps ensure that the rolls have a more uniform shape. If you have a kitchen scale, weighing them will help with that too. ???? Note to self: stop putting off buying that scale already. Geesh. Place the rolls into a lightly buttered quarter sheet pan or 9×13-inch pan. Cover with a clean towel and return to the oven. Let the rolls rise for 40 to 50 minutes, or until puffy. Preheat oven to 350 degrees. In a small bowl whisk together the egg and milk. Brush the tops of the rolls and bake for 20 to 25 minutes, or until golden brown on top (a digital thermometer inserted into the center of the roll should read 190 degrees +). You want the bottoms to be fully cooked. Remove the rolls from the oven and brush the tops with butter. Allow the rolls to cool for 10 minutes before pulling apart and serving. ???? 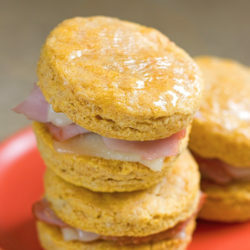 Enjoy warm with a smear of butter or whipped honey cinnamon butter. You can thank me later! Enjoy & happy baking!! 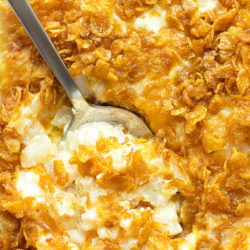 These sky-high heavenly dinner rolls are light, fluffy and absolutely divine. They're my go-to rolls for special occasions! To make the starter, in a small saucepan set over low heat, whisk together the whole milk, water and flour until smooth. Cook until the mixture thickens, about 3 to 5 minutes. Remove from the heat and set aside. In the bowl of a stand mixer, combine the flour, dry milk, sugar, salt and yeast. Mix on low until combined. In a 2 cup glass measuring cup, warm the milk in the microwave. Whisk in the starter, eggs and melted butter. With mixing speed on low, gradually add the wet ingredients. Mix just until a dough forms. Switch to the dough hook and knead for 15-20 minutes. Shape the dough into a ball and transfer to a lightly buttered bow. Cover with plastic wrap and place into a warm oven (I turn mine on to 200 degrees, then turn it OFF when it reaches that temperature) for 60 to 90 minutes or until doubled. Gently deflate the dough by pressing a fist into the center. Divide into 12 equal pieces, and shape each piece into a ball. I like to pinch the bottom of the balls of dough and then form a C shape with my hand and roll the ball on the counter to make a smooth, tout circle. That way the rolls have a more uniform shape. If you have a kitchen scale, weighing them will help with that too. Place the rolls into a lightly buttered quarter sheet pan or 9x13-inch pan. Cover with a clean towel and return to the oven. Let the rolls rise for 40 to 50 minutes, or until puffy. Preheat oven to 350 degrees. In a small bowl whisk together the egg and milk. 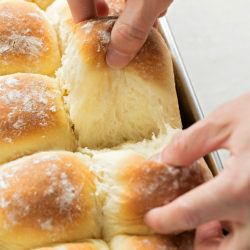 Brush the tops of the rolls and bake for 20 to 25 minutes, or until golden brown on top (a digital thermometer inserted into the center of the roll should reach 190 degrees +). Remove the rolls from the oven and brush the tops with butter. Allow the rolls to cool for 10 minutes before pulling apart and serving. 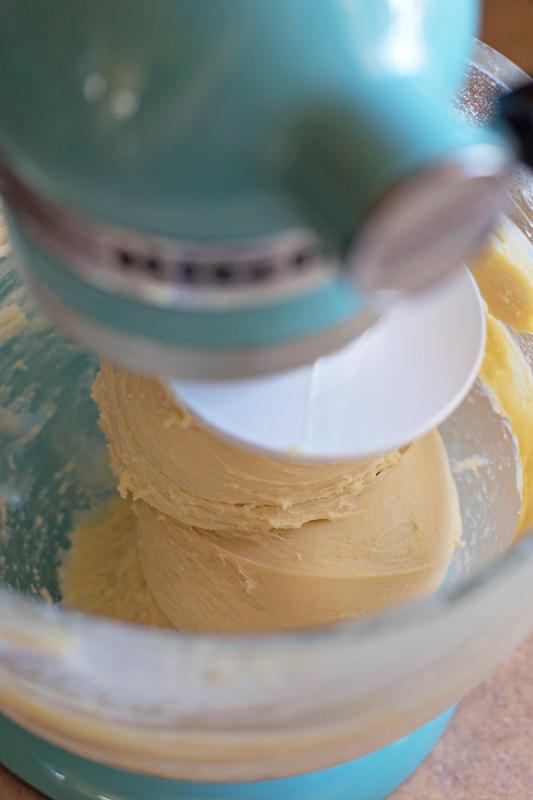 -If you don't have a electric mixer, try kneading the dough for as long as you can stand. The dough can also be kneaded in a Bosch mixer or bread machine. 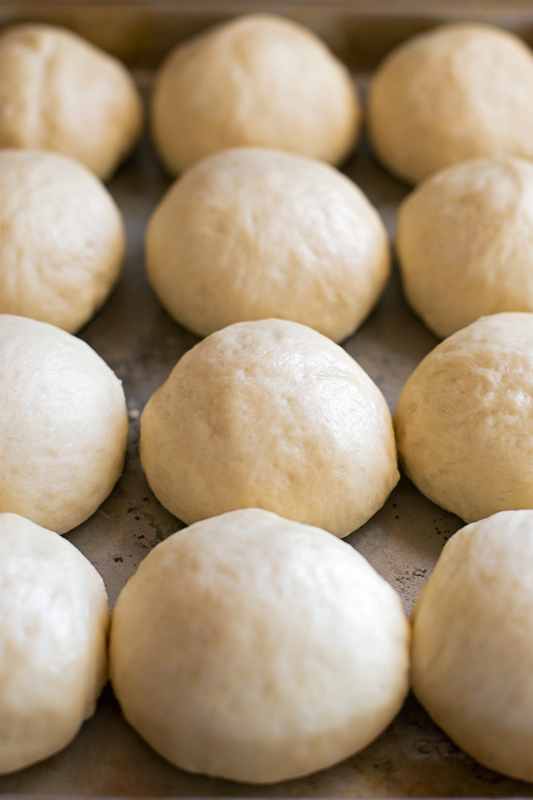 -Freeze these rolls and let them thaw at room temperature for a few hours before warming. Oh my. 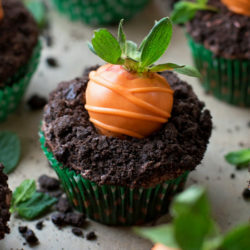 Those look even better than bakery bought! I can honestly say I’ve cooked so many things in my life, but never dinner rolls. 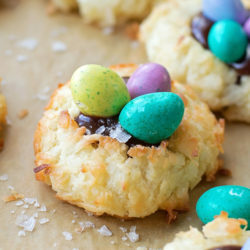 These look buttery, soft, and perfect. Dare I try them for my first?! I think so!!! 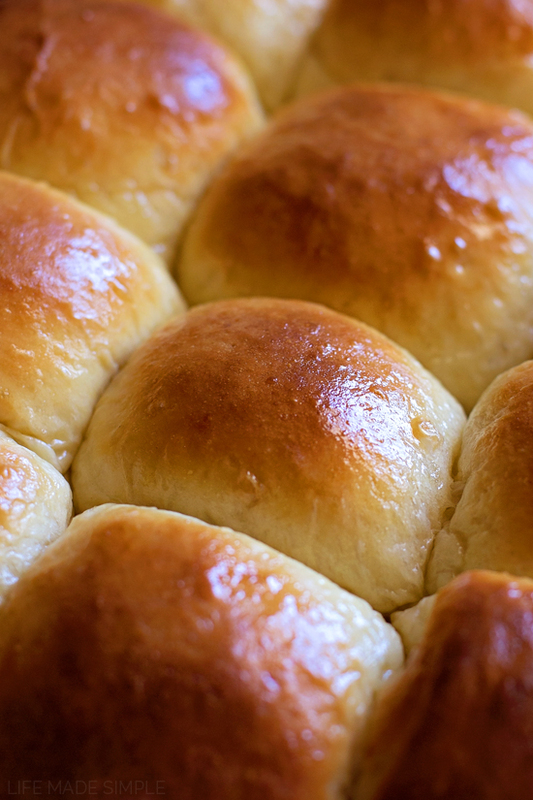 We love homemade rolls…….these look perfect! Thank for sharing. 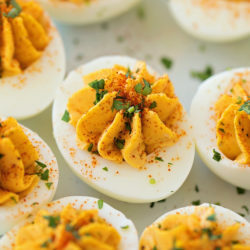 These look just perfect! Definitely worth the effort. WOW! 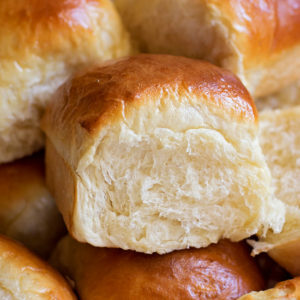 These are the best rolls, they look so buttery and perfect! The cooked starter is what intrigued me of this recipe. I regularly bake bread and decided to try it. I tweaked the recipe by reducing the sugar to 3 TBS, and did not add the powdered milk. The rolls came out beautiful and were absolutely delicious. Next time I will use honey instead of sugar to increase the hydration retention and see how they turn out. Thanks for such a delightful experience. I am making the rolls now. Is the dough supposed to be sticky? 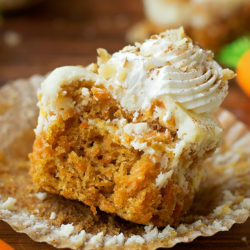 Have you ever made these in a gluten free version. If so, what flour would you recommend? I would use Cup for Cup or another gluten-free blend (Bob’s Red Mill or King Arthur Flour).